The second clue in The Frosted Pumpkin Stitchery Sweet as Pie Club stitch-a-long was released on June 15th. Each month a new pie is released as part of the cross-stitch pattern. This month is Key Lime Pie! 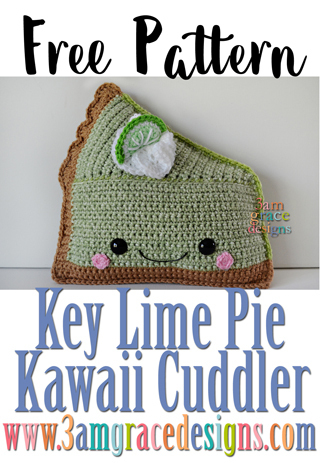 After stitching it, I couldn’t resist creating a Key Lime Pie Kawaii Cuddler too! You can check out Amanda & Ashleigh’s cute shop at The Frosted Pumpkin Stitchery! Below you will find instructions to make your very own pie! Enjoy! * Worsted Weight Yarn in tan, green for pie & lime, white, and light pink. Row 1 – Ch 30. DC3 in 3rd Ch from hook and in next 14 Ch. TR3 in remaining Ch across. Change to dark green yarn for the rind. With white yarn – stitch from center hole to outside white edge 5 times going back to the center each time. *Place safety eyes between rows 10 & 11 from the bottom of the pie crust, roughly twelve stitches apart. *Sew or glue cheeks in place. *Align Pie Topping along top of Pie Crust. Make sure your scallops are right side facing up – or your topping will be too short for your crust. Whip-stitch the Pie Topping into the BLO of the pie filling/crust. *Use puff paint or embroidery thread to create desired mouth. *Sew or glue whip cream and lime wedge in desired locations. *Align pie halves so ends of rows match. Single crochet around both pieces to join together. If you want your edging to match – make sure you change colors as you SC around. *Stuff with Poly-Fil prior to completing stitching. Make sure you work in a counter-clockwise direction so your stitches face forward. All photos and text are copyright © 2017- 3amgracedesigns. All rights reserved. Please do not sell or distribute this pattern in part or in whole. You are welcome to sell finished items you make from this pattern. A credit to “3amgracedesigns” as the designer is appreciated but not required.